After a resounding 3–0 victory over Williams on Saturday, Tufts had just one team in the way of a NESCAC title: Middlebury. The Panthers handed the Jumbos their only loss of the season, 2–1, earlier in the year in a tight overtime affair. Tufts failed to flip the script on Sunday, falling in the conference championship game, 1–0. The teams were locked in a steady, defensive battle all afternoon, registering just nine shots each. The Jumbos edged out the Panthers in penalty corners, with a 10–4 advantage. Four of those penalty corners came in the first 15 minutes, but to no avail. The Jumbos generated some good looks, but shots from the likes of junior forward Rachel Hamilton, first-year midfielder Sophie Scheoeni and senior forward and co-captain Gigi Tutoni were stopped by either Middlebury’s back line or goalkeeper. The rest of the half was dominated by Middlebury, as Tufts failed to register another shot after its initial run of penalty corners. The Panthers, meanwhile, continued to attack, and flipped the game on its head with a penalty corner in the 31st minute. A behind-the-back pass from Middlebury junior midfielder Marissa Baker met the stick of junior midfielder Emma Johns, who had a clear path to the goal. Johns’ shot rifled past first-year goalkeeper Andie Stallman, giving the Panthers a 1–0 advantage at the half. Tufts’ offensive woes continued into the second half, with a single failed penalty corner to show for the first 24 minutes of action. The Jumbos’ most promising chance to equalize came in the 60th minute, when Hamilton and Schoeni got off a pair of shots, but both were blocked. The Jumbos had a handful of penalty corners in the final 10 minutes, but the Panthers wouldn’t budge and secured their sixth NESCAC title. Despite the loss, Tufts’ has a strong final record of 16–2 heading into the NCAA Tournament, with both losses coming against Middlebury on the road. On Saturday, Tufts took on Williams in the NESCAC semifinals. The Jumbos got the best of the Ephs in the teams’ previous matchup, winning 2–0. After its 4–2 win over Middlebury late in the season, however, Williams had reason to be confident heading into the matchup with Tufts. The Jumbos were unfazed by a two-hour rain delay, perfectly executing a penalty corner in the sixth minute: from Salamone, to Hamilton, to Schoeni and finally to Tutoni for the early score. The teams traded chances for the rest of the half, but only Tutoni’s shot found the back of the net, giving the Jumbos a 1–0 halftime lead. The Jumbos’ momentum continued in the latter period, as their defense held the Ephs without a shot over the final 35 minutes. For good measure, Tutoni scored her 12th goal of the season off of another penalty corner, putting her fifth in NESCAC goal-scoring this year. She now sits a single goal behind fifth place all-time in program history. Another penalty corner later in the half found the stick of first-year midfielder Gillian Roeca, who gave the Jumbos their third goal of the game. 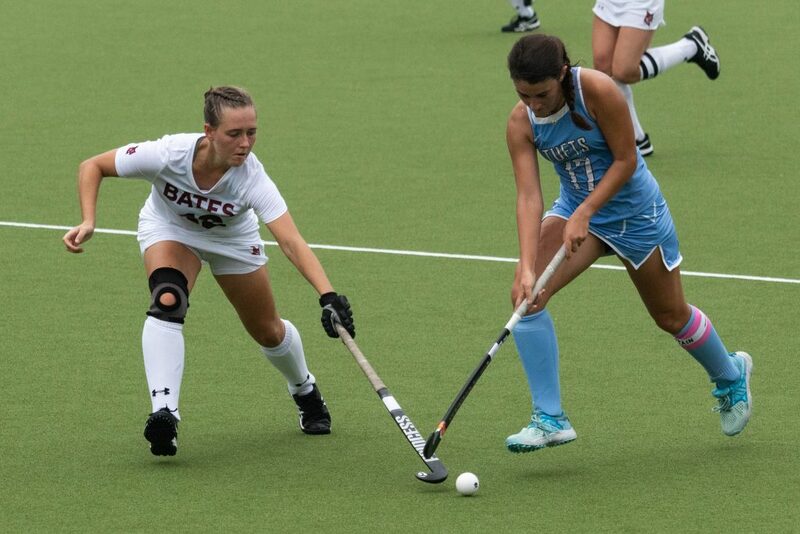 The rest of the match proceeded with a few more attacks from Tufts, including a missed penalty shot by Hamilton, but the team could not pad its lead, instead wrapping up a 3–0 win. Despite not winning the conference tournament, the Jumbos’ 16–2 campaign was enough to earn an at-large bid, and a first-round bye, in the NCAA Tournament. On Saturday, Tufts will face the winner of Wednesday’s matchup between Montclair State and Smith College in Salisbury, Md.